He is, of course, referring to the inexplicable criteria of self-regeneration at the basis of that concept of infinity that most people cannot seem to accept, fossilizing themselves on the so-called search of a “beginning” somehow instigated by a theoretical “originator”. However, energy – and, consequently, sound – does not need anyone or anything else to evolve, operate and heal (Roland Kayn would approve). On occasion its invisible form is rendered perceptible, courtesy of selected individuals who – for a change – might not be interested in making an audience believe they’re the owners of the unknown. Myers, either under his real name or the Arcane Device pseudonym, has been studying these processes alone, as every discerning human specimen should. He never talked too much to made us aware of his discoveries: the music truly speaks for itself. Electronically generated waves have a unique way to respond to the sentience of someone who deeply respects what will always remain a mystery for earthbound creatures, in spite of the latter’s delusional “progress”. They are pliable, harmonically rich, ceaselessly beautiful. The oscillations, in conjunction with sequential structures devoid of regular “patterns”, produce geometries that no word can carve in the stone of semi-illiterate presumption. 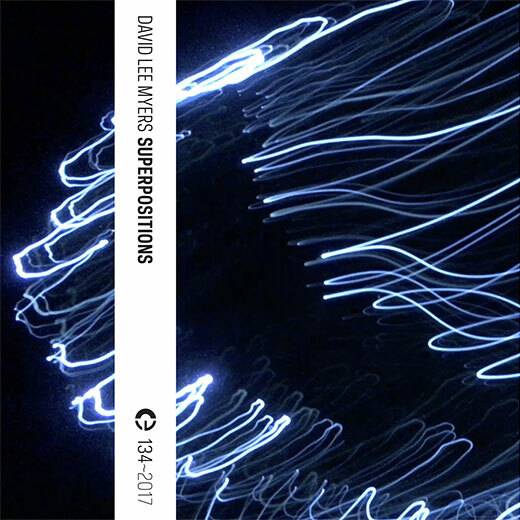 As in the bulk of Myers’ releases, the eleven tracks of Superpositions offer a chance for relinquishing the pomp of intellectual grandeur and stick to what really constitutes the nourishment of our very being. Merging stasis and movement through textural transformations appearing to the ears as utterly natural phenomena, Myers broadens the palette of knowledge without burdening one’s consciousness. An evident confidence with superior layers of understanding is directly proportional to the skilful organization of acoustic events that lots of wannabe scientists disregard as “bizarre noises”. This entry was posted in Reviews and tagged 134, David Lee Myers. Bookmark the permalink. Comments are closed, but you can leave a trackback: Trackback URL.